Jamie MacDonald, Luke Hendrie , Scott Boyd, Will Boyle, Steven Smith, Rory McKenzie , Greg Taylor, Gary Dicker, Jordan Jones (Adam Frizzell 89), Souleymane Coulibaly, Nathan Tyson. Subs Not Used: Devlin MacKay, Flo Bojaj, Callum McFadzean, Iain Wilson, Innes Cameron, Charlee Adams. Killie welcomed Dundee to Rugby Park on a cold but dry December Saturday, hoping to bag 3 points and a possible top six place. A minute’s silence was impeccably observed before both teams set out their stall. 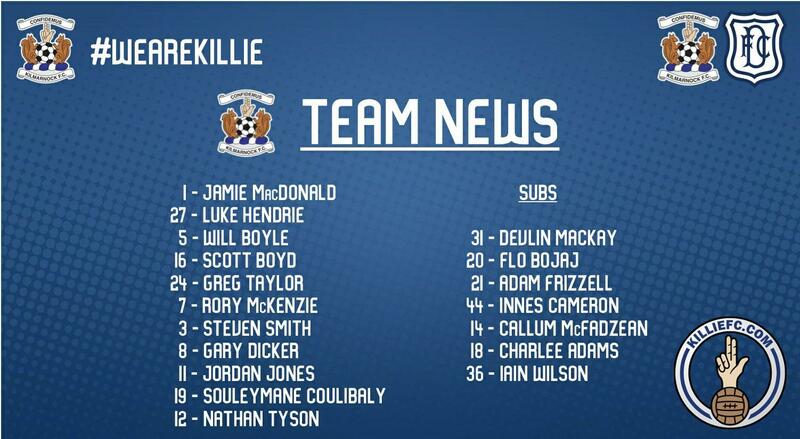 Killie lined up with a similar team to the one that recently beat Hearts comprehensively, with Coulibaly and Jones on the flanks and Tyson through the middle, still hoping to break his duck. The game started very slowly with the only real highlight being a rash tackle by Kerr on Jordan Jones that drew the game’s first booking. However, slowly but surely, Killie’s midfield began to get on top, with Dicker in particular, pulling most of the strings. Yet, a solitary header by Tyson that sailed over the bar was all that they could show for their early dominance. In the 18th minute, the home crowd brought the game to life with their pre-planned chorus of “we want Johnston out”. Two minutes later and Rory McKenzie had the ball in the net. The ball broke to the Killie midfielder after a blocked shot and he coolly curled a shot into the left corner of the net. Killie then went for the jugular with strong runs and shots from Jones and Taylor almost increasing their lead. Tyson then missed with another free header before Jones had another effort blocked after neatly cutting inside his marker. Coulibally, who had a fairly quiet first half was then booked for not fouling Paul McGowan, the Dundee midfielder doing a great impression of Dougie Imrie! Then, Tyson had the ball in the net but was adjudged to have been in an offside position. The first half ended with Killie enjoying a slender lead but with having completely dominated their opponents. Paul Hartley sent his men out early for the second period, clearly disgusted by their first half performance, and to be fair they did start the better team. Marcus Haber got on the end of a fine cross from the left and really should have done better than send his effort wide; then a Holt effort drifted past the post. Just before that, a Tyson strike had clipped the crossbar as the Killie front man hunted down that elusive first goal. Killie’s strength lay with Jones and Taylor combining well down the left; however Jones would waste several chances after getting in good positions. Just before the hour mark, Boyle rose well to connect with a Jones corner but his header was just wide. At the other end, another good cross from the left found Craig Wighton but thankfully for Killie he could only find the side net. Killie then cranked up the pressure with several corners on the bounce but they just couldn’t break down a resilient Dundee backline. They needed an impetus from somewhere and they got it with another chant from the stands of “we want Johnston out” after 69 minutes. This time, Coulibally (right) stole a yard from his marker and slammed the ball into the roof of the net from another Jones cross. Hartley then brought on El Bakhtaoui and Loy in an attempt to try and salvage something and they did bring more energy to their attack. McDonald saved a goal bound header from Williams late on but Killie looked the more likely side to add to their lead as they broke at pace. Tyson had another effort ruled out for offside before a brilliant run and shot from the Englishman was saved by Bain. McKenzie also stung the palms of the Dundee keeper in the final minute. The final whistle brought a fine 3 points for Ayrshire’s finest – and a top six place at last! Best for Killie were Dicker, Jones, Tyson and Taylor; although every player received pass marks. Best for Dundee was Bain – he saved his team from a real hiding. Next up is a midweek trip to Pittodrie and Killie should go there with absolutely nothing to fear. Lee Clark: "I thought it was a dominant performance from start to finish. We created numerous chances. 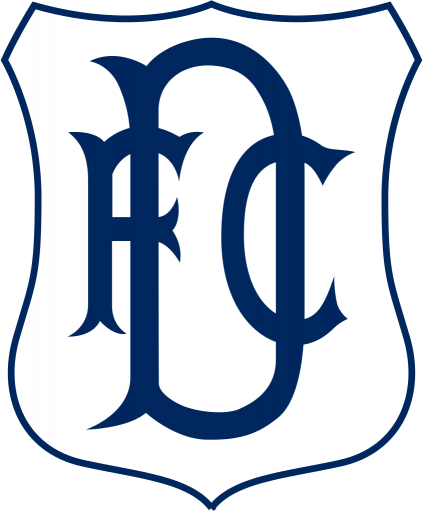 I thought to a man the players were fantastic, stuck to the game plan, we forced Dundee into a system change, albeit towards the end of the game. It was a thoroughly deserved victory and it could've been by a bigger margin. The games where we're playing teams in and around us, we have to have someone in goalscoring form. Souleymane does a lot of unseen hard work for us, but he's getting his rewards with the goals, the players appreciate what he's doing."